In 2011, Lord Francis Maude, then Minister for the Cabinet Office and Paymaster General, openly and frequently challenged the status quo regarding UK Government ICT spend. Having witnessed enough departments waste millions of pounds over the years, in exchange for lengthy, ineffective and often failed implementations, he mandated departments to utilize both Small to Medium Enterprises, as well as Open Source technologies – in a bid to open the market, and to provide faster, more innovative digital change. His vision was to encourage departments to move away from big bang solutions delivered by the same large suppliers, to a greater number of smaller and more agile projects. That was also the year I joined iO1, an Open Source SME, with just 11 team members at the time. Against the advice of many, Fintan, iO1/Invotra founder, decided to grab the opportunity and take a laser focus to Government ICT. We had first class credentials in the Open Source space – we just needed to find our internal champions and wade through the treacle. The opportunity, coupled with our expert software development credentials made it a natural, yet admittedly somewhat uncertain, fit. Allowing determination and confidence in our capabilities to thwart any uncertainty, we worked hard, found those champions and kept our heads down. Admittedly, the initial procurement hurdles certainly didn’t help, however over the years, they became less of an obstacle thanks to the continually improving Digital Marketplace. Fast forward a few years and that Open Source, SME formed a SaaS product company called Invotra. 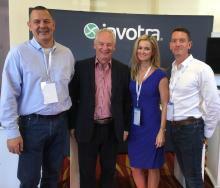 We met Lord Maude for the first time at the 2016 Code for America Summit in Oakland, California this week. I introduced myself (okay, admittedly I loitered until he had finished his coffee but at least had the good manners not to interrupt him mid-sip?!) and told him we wanted to introduce ourselves as company, but more importantly to say thank you. As a consequence of his innovative vision, we could work with Government and turn ourselves into a 38-man product house, servicing 45% of Central Government with an application that not only saves them millions of pounds, but delivers a significantly enhanced service in return. It was a highlight of an already exciting two days, in addition to being a timely reminder of the genuine value we work so hard to deliver. Although now retired, Lord Maude was invited back to speak at this year’s Summit, to share his experiences with his US counterparts, as the US look to what UK Government has achieved, with admiration. His advice to US Government? … “stop the madness & just do it!”.